Here are a couple of photos I took during the shoot. I had a baby in my arms most of the time, so I don't actually have very many photos to share. Lili sent these gorgeous white amaryllis from New York. I really loved the gracefulness of the amaryllis and will soon start forcing some bulbs for the holidays. 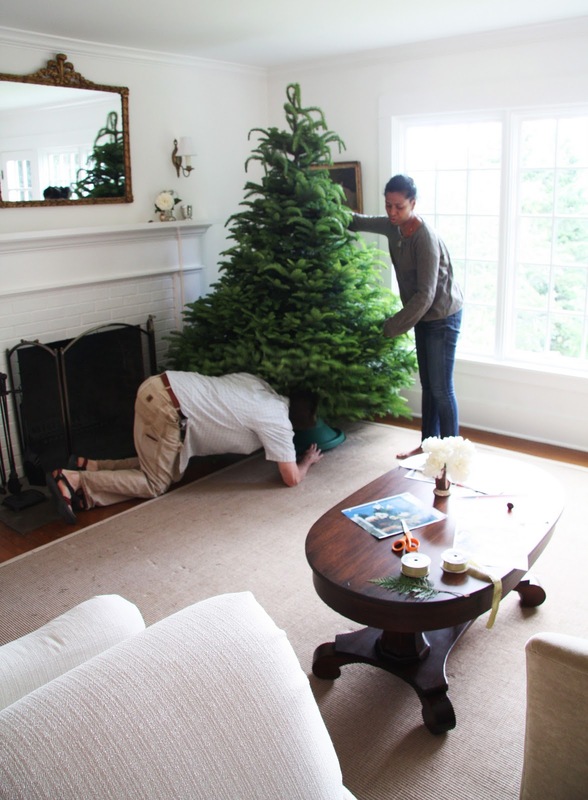 Here are Lili and Mike setting up the tree before she and I trimmed it. How fun! I just picked up my mail today. I've been subscribing to your blog since you announced your pregnancy, even though I haven't commented since that big announcement. I look forward to reading my magazine. Have a very sweet Christmas with your babies. I have that very issue on my coffee table now. You must be so excited! Your living room looks delightful as always. Congratulations for being published! And on the cover - wow! You are going to have such fun with your two little ones this Christmas. Bet they've been introduced to snow! One of my favorite magazines and one of my favorite blogs! I LOVED the article and was thrilled when my magazine arrived in the mail! CONGRATULATIONS! loved the article, you all (including the house) look beautiful as usual. I especially enjoy whenever you talk about your fertility issues, it's so nice to see your lovely family now. It is the best issue of Country Living EVER!!! Your house looks amazing. Congratulations to you and Mike on your beautiful issue! What a wonderful keepsake for the sweetpeas- their first Christmas was in a magazine. p.s. that is a gorgeous xmas tree! I love the top. Congratulations! Your living room is gorgeous and you are so deserving of being on the cover! Congrats------- your home is so nice! And this magazine- I read alltimes when I was in the states! I'll feel a particular thrill when I pick up my copy of the magazine. Congratulations! Oh my goodness, Trina! Congratulations! How amazing and wonderful. I can't wait to go pick up a copy. My copy with your gorgeous living room on the cover arrived yesterday, Trina. I am so happy for you!! I received my issue last Tues & have been patiently waiting to see if you were going to talk about it! I was flippin' out.. "OMG, this is Trina's house on the cover!!" (Of course my husband had no idea who I was talking about.) I loved the article & all the photos were just beautiful. In all honesty, I hadn't even had a Country Living subscription but when you blogged about being in the Dec issue, I made sure to sign up ASAP-- couldn't miss the oppotunity of having magazine photos of one of my favorite homes! Your living room looks gorgeous: everyone's Christmas dream. Congratulations Trina - your home is looking beautiful as always! Congratulations! The snowfall sounds super festive! Roll on the Holidays! fantastic! i am new to your blog so i missed a lot but i look forward to catching up! congratulations! Funny our homes are both on a Christmas issue! Mine is on "Vivere Country" (which means exactly Country Living) and it is such a wonderful emotion! And another funny thing: the photographers of the magazine were here two months ago and I wondered around with my baby in my arms just as you!! Wow, so exciting to have your room on a magazine cover! That mag, I think, is sold in some bigger bookshops in Finland too - I must keep an eye on the magazine shelves now. You have a very, very stylish and cosy (at the same time!) house and a warm style to write. It was so much FUN to see your home featured in Country Living! Your babies are so precious & such a blessing! Enjoy your wonderful life with your family! Congratulations! My issue arrived over the weekend and I thoroughly enjoyed the article. Best wishes to you and your family this Thanksgiving Trina! That is so cool to be published - your living room looks just beautiful too!! I just picked up my copy this weekend..haven't had a chance to look at it yet. Your living room is indeed, magazine worthy. Trina, congratulations on being featured on the cover. How thrilling! I haven't received my copy yet in the mail, but I did see the magazine yesterday at the grocery and I thought, "What a pretty cover!" I had no idea that it was YOUR living room! I can't wait to get it in the mail so I can read the article. I know this Christmas will be a very special one for you and Mike, sharing all the traditions of the beautiful season with your twins. Enjoy it all and have a lovely Thanksgiving too! Your home . . . your story of the before "sweet peas" and the after is one I look toward to seeing and reading each time I see A Country Farmhouse on my screen. I look forward to holding County Living in my hands and viewing your "Christmas In July" photo shoot. and truth. You are such a favorite of mine . . . I was so excited to get the magazine this weekend - the one WITH your living room on the cover : ) Instantly recognizable, except the mirror is missing! I always love looking at your photos online, but there is something extra special about seeing your home in print. Congratulations Burke family! Enjoy all your blessings this Thanksgiving and Christmas, especially the beautiful babies. I hope you have a lovely Christmas with your sweet family! You have every right to be very excited! What a wonderful Christmas this will be for all of you. You will be making memories for a lifetime. I hope you bring us along for the ride. The magazine spread is magical. I am only seeing one cover around here, your living room. My favorite cover indeed! I got the magazine and was so excited to see pictures of your home!! Wishing you and your family a great Thanksgiving and a wonderful Chistmas. I loved seeing your living room on the cover of my Country Living. How exciting for you to have your home featured in their magazine! Everything in your home is so beautiful. Happy holidays to you and your family! I'll be checking our mailbox fo my Country Living!! What an exciting year for your family! I cannot wait until my copy arrives. Your living room is beautiful!! It's all so exciting Trina! I enjoy your blog as I also live in an old farmhouse that has belonged in my family for a long time. It was so ironic when I saw the table on the cover issue of Country Living because just this weekend I had an interesting experience. My Aunt's family (on my mother's side) was preparing for an Estate Auction. They discovered in a table identical to that one the name of my grandfather (on my father's side) neatly nail-tapped inside the drawer. They were wondering how she had the table when it belonged to someone outside the family. I knew I had to have it because it belonged to my grandfather. I was able to bid for the table and now it is back "home" again. I love the article! I was reading it when I realized it was your house. I told my husband and said it was my blogging friend's house. He laughed at me! It is wonderful. I knew it was your livingroom as soon as I looked at the cover of my Country Living. Congrats and have a wonderful holiday with your family. oh trina how v exciting, the cover! yay for you guys. you know me, i'm usually dreading the holidays but just reading this makes me actually look forward to them. sharing the holidays with little ones is just the best, nothing like it! enjoy every last smackeral! That must be the wildest feeling to see your home on a magazine cover!!! Congrats! Trina, I spotted the CL Issue on the stand yesterday, and immidiaely picked it up.... I reconized your home right away from my frequent visit to your blog :-) thank you for sharing a few behind the scenes images, have a wonderful christmas season with your beautiful family! Enjoy every moment... and your wonderful home as well! Just got it in my mail! What a delight! Congratulations! So beautiful, you deserve all the attention! I don't usually post any comments, but as a reader of your blog I was so excited to see your home featured on the cover of my Country Living magazine. Every picture was beautiful and the article so sweet. You have a gorgeous home that is always an inspiration to me! Congratulations! I received my copy last week with your home on the cover and very much enjoyed the article and photographs of your beautiful home and family! Congratulatons! I was looking through my magazine the other day and I saw your name and thought "I know who that is!" It was so fun to flip through the pages and see your home as I've seen it on your blog for so long now. Congratulations on such a well deserved and beautiful article! I was SO excited to have my Country Living Magazine arrive. As soon as I saw it I started shouting to my husband, "Babe! This is that blog I've been following for years!! This is their house!" I received my copy of Country Living on Friday and as I was flipping through the articles I told my husband, "I know this blogger!" How wonderful that your blog brought about you being featured in a magazine, and Country Living at that. I enjoy your blog so, and of course, the photos of the sweet babies. Have a great holiday season! I just recieved my copy the other day. I haven't read it yet, but now I am so excited!! Country Living is my favorite magazine and it is so fun to know the back story about a house and family that the highlighted. Congrats, Trina and Mike!!! it is so beautiful. Your snowfall sounds wonderful and we're looking forward to Christmas here to. Lovely! Congrats on the magazine cover. Speaking of the holidays, I've got a fabulous giveaway going on right now. Stop in if you get a chance. 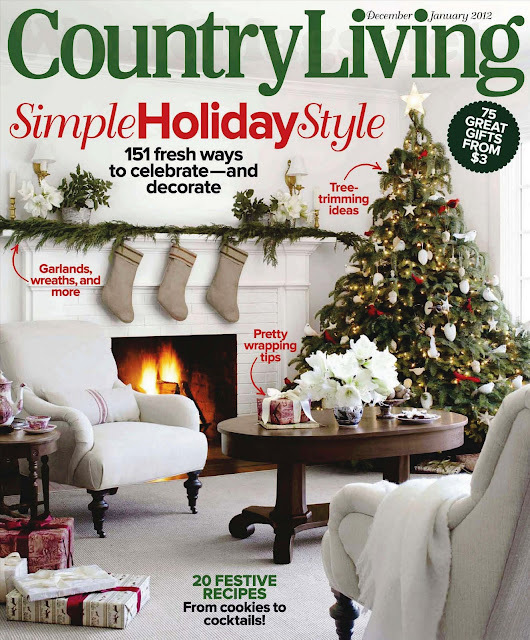 As one of your faithful readers I was tickled pink yesterday to see your living room on the cover of Country Living! I have shared your musings with my husband and we've truly been inspired to keep focused on our "country hearts". What a joy it was to sit and read your article with my 8 year old daughter Jackie last night. She said it best, "Mommy, that's where I want to live when I grow up." Me too kiddo! congrats! Your home is so beautiful, I'm sure the issue will be amazing! I have been following your blog for a while and when I got my copy of Country Living I recognized your living room right away and was SO excited! (ha, that sounds so stalkerish...) :) I just love your classic and elegant sense of style, thanks for the Christmas inspiration! How wonderful! I just received mine in the mail last week and it is sitting on the end table just waiting to be devoured! Love the cover! How white and bright your place looks on the cover. I can't wait to get my issue to see the rest. It will be intersting to look at it knowing that it was done in July. Absolutely stunning! What a beautiful home you have! Congratulations!! It looks so beautiful! Congratulations to you both Trina! I have always enjoyed reading your blog...off to get my copy! Congratulations Trina & Mike! So exciting! I know your home will be so lovely this Christmas...especially with your little ones to share all the *magic* with! I am very excited for you, too! I am dying for mine to show up in my mailbox. I wonder which cover I will receive? Congratulations to you all! So excited for you! Can't wait to look through it! I just read the article last night, and while I'm not usually a commenter, I had to stop by. I loved the article so much and your home just SHONE in the magazine. Wow! Your family was made to be in a magazine. What a lovely story of your twins and your home. I really enjoyed reading it and feeling like I "knew" someone famous. Congrats! It was so exciting to see your beautiful home on the cover of CL! So happy for you and hope y'all have a very merry Christmas. Mine came today....with your cozy living room on the front cover!!!! LOVE IT!!!! Stunning! Congratulations! I can't wait to pick up a copy. I love your linen stockings- did you make them? After an exhausting day running around, I arrived home to a stack of mail, looked at the cover of CL and thought could it be ACF??? And, wouldn't you know I flipped right to your kitchen, which I recognized immediately! I just loved seeing your beautiful house in print, CL really knows how to do it with their great big photos! You know how much I love your house and style, so this was a thrill for me too. A big congrats to you and Mike. I got my issue a few days ago, and honestly, I like the photos on your blog better than the ones in the feature. For some reason, photos of all-white rooms in this magazine (and some others) always look a bit overexposed! But, WE know how beautiful your home is! I don't get the magazine, so thank you for the post, and the link to the July post. Fun to see! My copy just arrived on Friday. Your living room is absolutely gorgeous! Congratulations! It's a beautiful cover very fitting for Country Living Magazine! Your blog is wonderful - I've really enjoyed reading your last few posts...it's one of those blogs that makes you smile! Congratulations again! I was so excited to see it at the grocery store tonight, I bought it right away:). Your home looks SO lovely decorated for the holidays. And a beautiful family photo as well:). Happy winter!! How awesome! I just picked up this issue and had no idea! Congratulations! What a bright and beautiful cover! Congratulations! SO exciting - congrats!! By the way, I love that collection of breadboards! I just got my CL yesterday in the mail. I have been looking forward to it ever since you mentioned you would be in it. What an honor that must be. Thank you so much for sharing your lovely home, your awesome little twins, and you life with me. How exciting to see your house on the front of Country Living! Our house plans were that magazine's house of the year in 1988, so I've always meant to send it in to see if they'd be interested in including it in the magazine. I'm gonna do that one of these days! I have the issue with your living room on the front and I love it. Best issue of Country Living in years! Your house is breathtaking. Thank you for sharing it. Been waiting for my December issue.... congratulations. Your home looks beautiful, as always. Trina and Mike, the magazine is on my table - thank you for another moment of beauty to highlight my day. On Saturday the CL issue arrived at my door. It took one llook and thought, I know that room! And indeed I do! Thank you Trina and Mike and babies for keeping my in country dream land. So exciting !! Congratulations !! Your home looks fabulous, as always. Love your beautiful home! I am new to this blogging thing, but I stumbled on your blog last week. Of course, I pored over all the pictures. Yesterday my Country Living magazine arrived, and I couldn't believe it! There you were! And so deserved. Your place is fantastic! And I loved your moving story about your twins. Hello! That is your living room on the cover of my Country Living magazine?!! Wow, it looks great! I just stumbled upon your blog today too and I love it... I am your newest follower! Congrats!! I'll definitely get a copy!! When a new magazine turns up in the mail, I save it for my "bedtime story," often not even looking at the cover because I want it all to be a surprise just as I did yesterday. Imagine my delight to find your home and then I was reminded of reading all about the shoot on your blog. Congratulations. The photographs and story are lovely. Thank you Trina for inviting us into your home and introducing us to your family via your warm commentary in your blog and this special article. Dare I ask about little Lucy. I haven't seen her lately nor was she mentioned in Country Living. Is she well? Have I missed news of her? 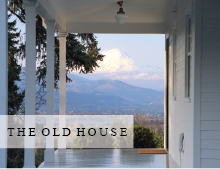 I have always dreamed of having a gorgeous farmhouse and yours is exactly as I envisioned. Growing up on a farm, I always see myself going back to that lifestyle. I love all the white, the beautiful accents, and the VIEW.! We are building a home again for the second time in 2 years ( our forever home) in a place I've always wanted to be but after seeing your home, I can't help but wonder if we should have gone for the farm house like we considered. Oh Trina, I'm so happy for you!! I was actually looking for the magazine in the store the other day, but it hadn't come out yet (I have a subscription but was impatient to see it! ), and to see it here now, with your beautiful living room on the cover, well, it gave me goosebumps, it's just a dream come true! I'm in Cal. at the moment but I bet my copy will be there when I get home...I can't wait to see it. To reach this moment after all of yours and Mike's hard work, all of the 'of courses', and all of the love, sweat, and tears that went into creating your treasured home is such a blessing...and so greatly deserved! Oh you guys, how exciting! I was jumping up & down in the Living Room waving the iPad in the air like a mad woman when I saw this news. Even MOTH got interested & wanted to read your post. Congrats, as this is the FIRST blog post he's ever read! I just found your blog through the magazine! Congratulations on the gorgeous feature and for the cover! I received my copy in the mail yesterday, with your living room on the cover! So happy to find a new blog to love. Happy Thanksgiving! Thats the cover we have here in Canada...and your home is lovely!!!! SO happy for you,you must be on cloud 9!!! The article was great! It was funny, I received my issue in the mail and looked at the cover and was like, "Hmm... this looks familiar." and then remembered your earlier post about the photo shoot. Such fun! Your house is absolutely the most fabulous I have seen in many. many years. You are living a dream of mine - to find and bring an old farmhouse to life with grace and beauty while making it 21st century functional. You are amazingly talented. What a wonderful place to raise your beautiful babies. Love your blog. It's a visual feast and it delights my eye every time I visit. Congratulations! Well deserved... your home is beautiful! Funny story, my husband put the copy next to my nightstand and said that fireplace looks like ours (except we don't have as much woodwork). Then as I was flipping through it to find the article I came across the kitchen and said hmmm why does that kitchen look familiar, so I went to the beginning of the story! I told my hubby this is Trina's blog! Love the article! 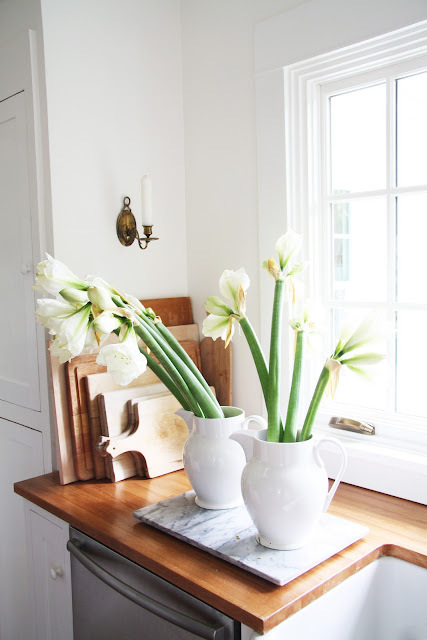 Like so much those white amaryllis in the white jugs! I live in the Pacific Northwest in beautiful BC. I see that we both have French country sinks. We live in a very small arts and crafts bungalow which has heritage protected and registered interiors which are in their original dark Douglas fir. I often yearn for white so I will be visiting you often! Congratulations on the Country Living cover! Congratulations. That must of been so exciting for you. I will have to get a copy of it. Loved seeing your (gorgeous) home in Country Living - Many blessings to you both as you share the holidays with your sweet babies! I just finished reading the article in Country Living and had to literally drop every thing to see your blog! Your home is breathtaking. The stone patio your husband MADE blew me away. Is he self taught? Count me in as a regular reader from now on. I have bookmarked you and every thing! Picked up Country Living, took one look at the cover and said outloud,"Hey, I know them!". Congratulations. I was so excited when my issue arrived with your beautiful home on the cover! I'm so inspired by it especially the simplicity. This year I'm leaving half of the decor I have in boxes and trying to keep it a lot simpler and more natural. Have a wonderful season! I would also like to add my congratulations to you guys ~ well done! I just received my first issue of Country Living in the mail and have been excited to read it, now I really can't wait! What a beautiful and happy time for you ~ I have really enjoyed your writing, the photos of your home & garden and seeing the babies grow, they are so sweet! Merry Christmas to the four of you! Congratulations. The cover and room are so pretty! I used a mantel from Dec 2010 Country Living as my inspiration this year. Just posted about it today. After looking for about three weeks, I finally located a copy of CL here in AZ but it had the decorated tree on the cover and not your livingroom. :-( Article was great and the photos wonderful, especially one of the family. So wonderful to be in such a beautiful magazine. Of course, your home fits all the criteria!!! Beautiful! I just came via Pat @ Back Porch Musings, so nice to meet you.....I had no idea it was your livingroom on the cover of my Country Living, congrats !!! your children are beautiful, enjoy they grow too fast.